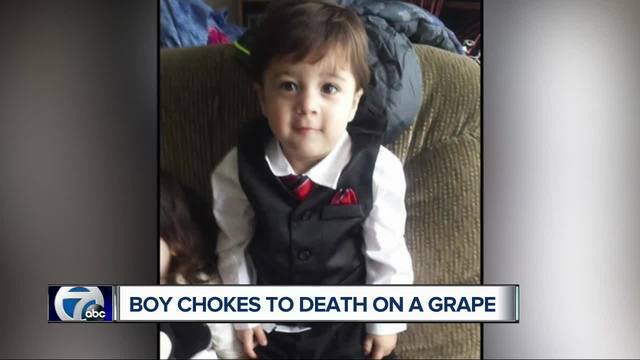 A family was left devastated after their toddler choked to death on grapes (video below). Emma Carver said she was at a grocery store with her 2-year-old son, Ayyan Umar, when the choking began. The toddler was sitting in the cart while his mother looked at cheese, and began eating the grapes that were in the cart with him. Carver said she had no idea he was eating the grapes, and turned towards him when she heard him make choking sounds. "I even threw the cheese down and I started banging on him," Carver told WXYZ. The mother said she hit her son's back several times in an attempt to dislodge the grapes. "But it wasn't getting it out, so it had to be lodged," she said. A shopper reportedly called 911 while another tried CPR. Medics responded approximately six minutes after the call and were able to remove one of the grapes. The boy, however, was already deceased. "I was feeling like maybe it was a bad dream, maybe somebody gonna wake me up," the toddler's father, Mohammad Umar, said. "He sleeps on my chest. I see him everywhere." Carver said she and her son's father signed up for a first aid class after Ayyan's tragic death, and encouraged others to follow suit. Many readers expressed shock and sadness over the loss of the toddler. "The mother should have been watching her child more closely. Accidents do happen and oh so quickly. Thoughts and prayers go out to the parents and his family. So sad for all!!!" one Mad World News reader commented on the site's Facebook page. "How tragic, so sorry. RIP little one," another wrote. "This poor family~ How do you ever move past that," another added. Some readers advised that all parents should be trained to help their children in the event of a choking situation. "It is more than being careful the child doesnt grab and eat something like that. you all need to be trained in how to do the hemlich which will get that grape to come out of the throat. you try and clear the throat with your fingers and then if that doesnt work you try the hemlich. REad up on it online even. It will propell the object out," one Mad World News reader wrote. "I had a student choking on a gummy bear and i did it on him and he slobbered the bear out of his mouth. then was ok. Get trained. so you can help."